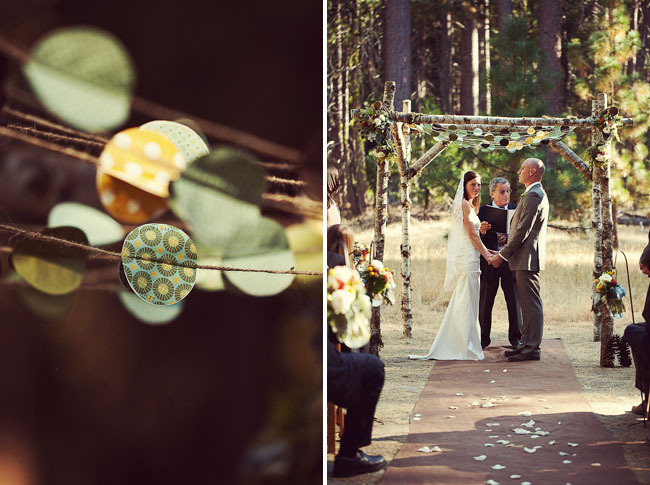 Yosemite is one of the most beautiful places on earth – imagine getting married there! Not much you need to do in terms of decor, but Beth + Kevin still added lots of their own unique touches to their wedding. 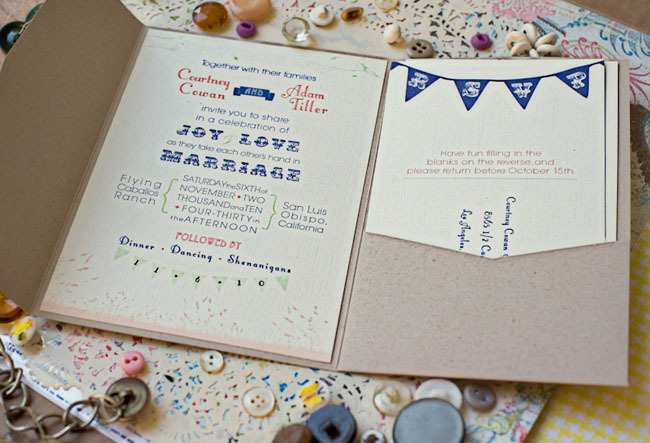 They made the chuppah themselves as well as all the reception tabletop details and paper products. 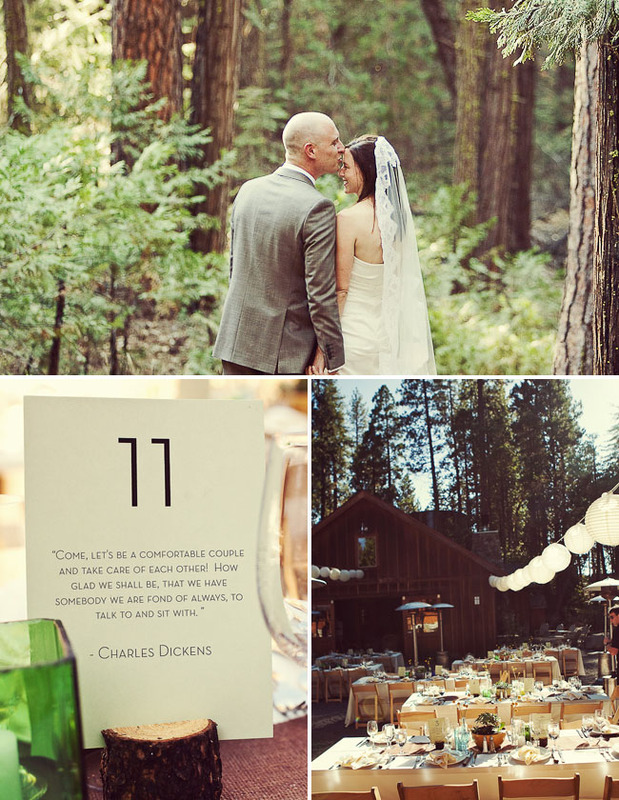 I love how their details + wedding style completely echoed the grandeur + majesty of the venue and Yosemite. Very them, not over the top, and so Yosemite! I just love their DIY chuppah! They even incorporated all their guests names and their favorite virtues about themselves in the paper details. Their ceremony procession included their family dancing in down the aisle. 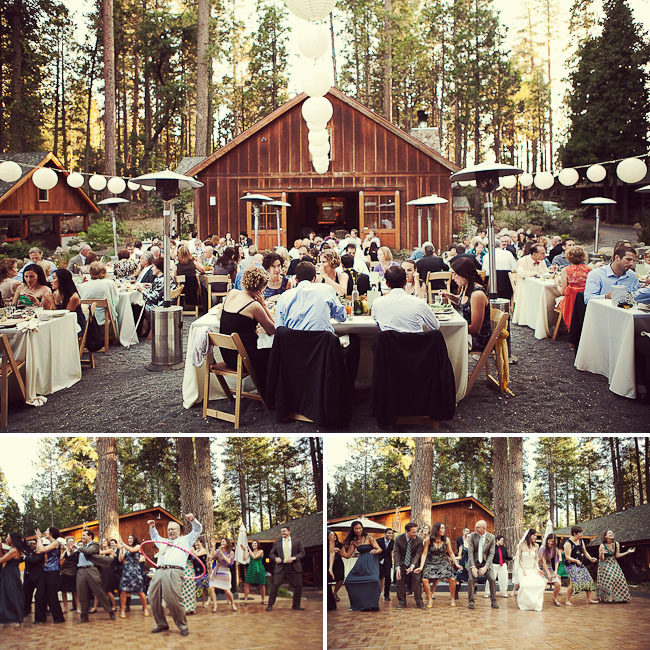 :) Then they had their first dance right after they were pronounced man and wife – love that! Best wishes to Beth + Kevin! I just love the idea of the fingerprint tree!! So original! Wowza! That’s a whole lot of pretty! I can’t get over the adorable picture of the bride with her tiny attendants. They look like cherubs. What a fun, wonderful and personal wedding. The pictures are GREAT! I love every single thing about this wedding. 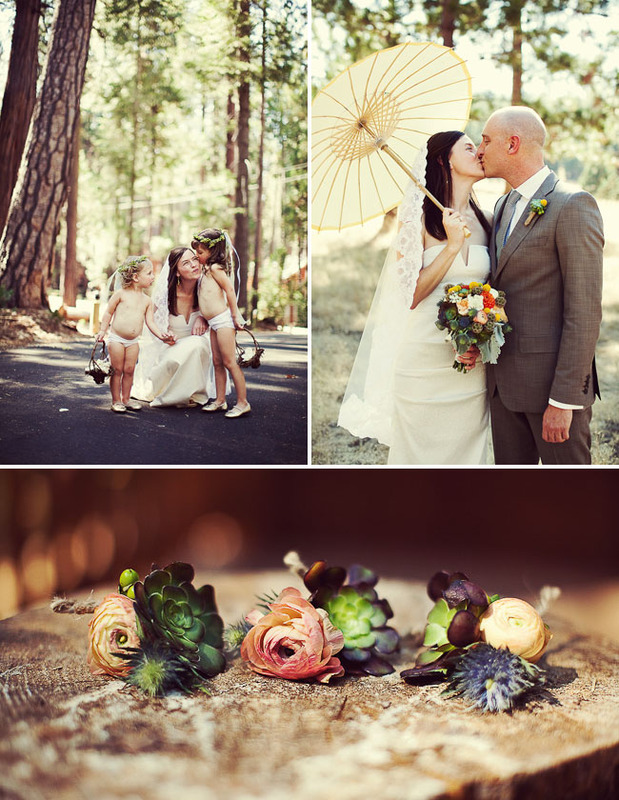 Such a lovely Yosemite wedding! It was the perfect setting for the big fingerprint tree! I agree with the above comments 100%! The venue was stunning- I almost wonder who wouldn’t prefer the great outdoors to a stuffy indoor venue. 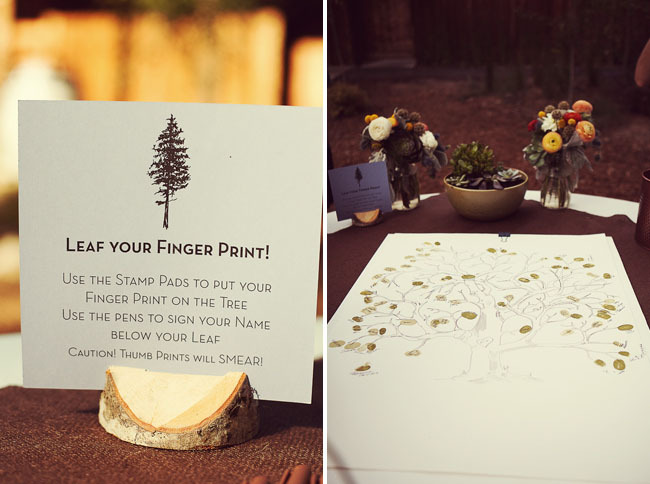 I LOVE that guest book idea using the fingerprints! I’ve never seen anything like that before…so neat! The venue is to die for!! The outdoors are so beautifully captured in these images. Love the table setting! WOW! This wedding looks GORGEOUS. I hope mine looks half as nice. My fiance really likes the suit. Any ideas where it’s from? I LOVE this wedding. 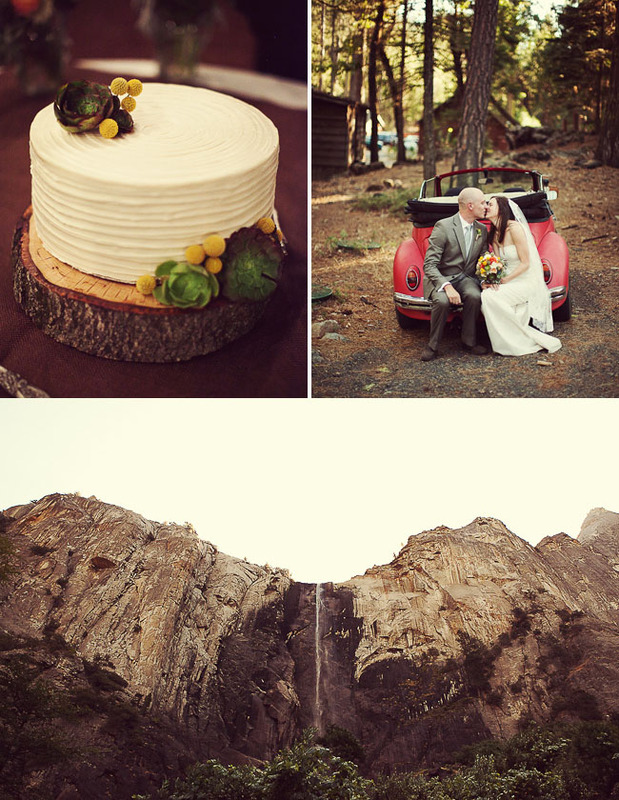 Yosemite…what a gorgeous place to get married!! Very pretty but I’m not feeling the “human cherubs”. Seemed a little too far fetched. 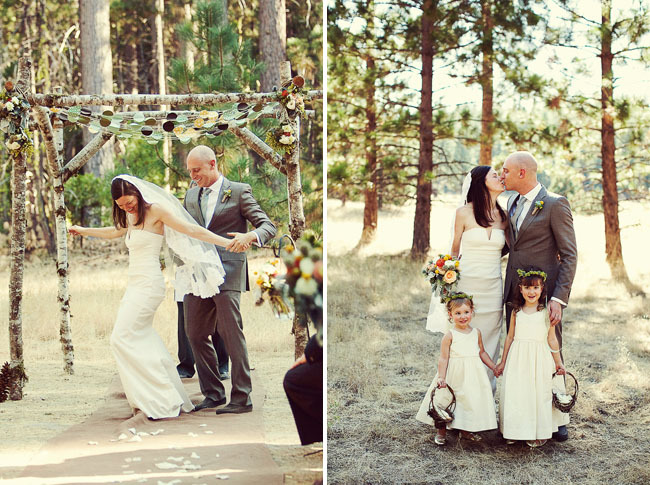 It would be my DREAM to get married in Yosemite! Yosemite is the most amazing and beautiful place I’ve ever been and I cant wait to go back this August with my now fiance! Thanks for your comment! Just wanted to let you know that the little girls did wear dresses for the ceremony (if you scroll down a few photos you can see them in their dresses) – that was just when they were getting ready which I thought was such an adorable photo! Hello! 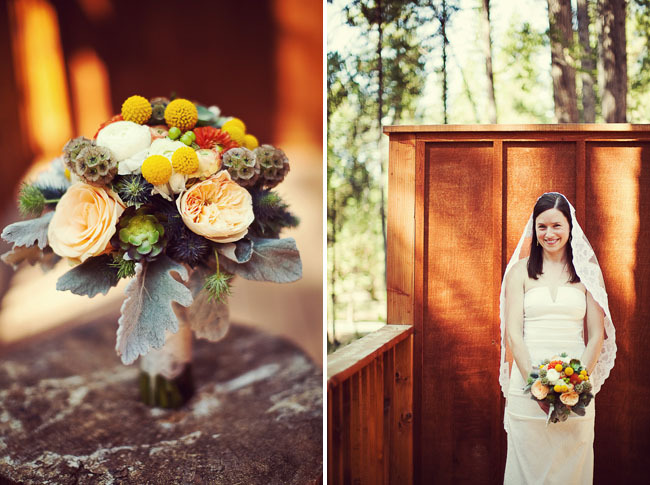 I absolutely love everything about this wedding…especially since I spent my childhood summers in Yosemite. It is home to me. I am engaged and Yosemite is always where I wanted to get married. Please Please tell me how you can do this the way you have because when I have looked into it, it states you cannot put out chairs or do anything like I am seeing in these photos. What is the exact location that you are able to do this in Yosemite? This looks like a fairy tale wedding. Simply divine. Wow! 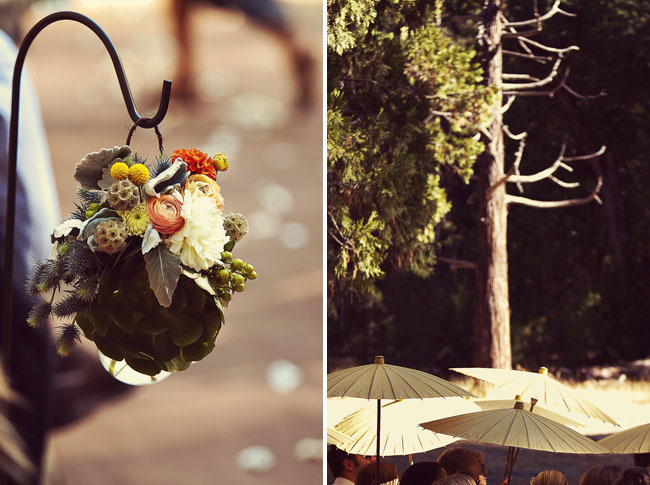 Such a beautiful, rustic outdoor wedding. I’m in love with every last detail! Love the thumb print tree! 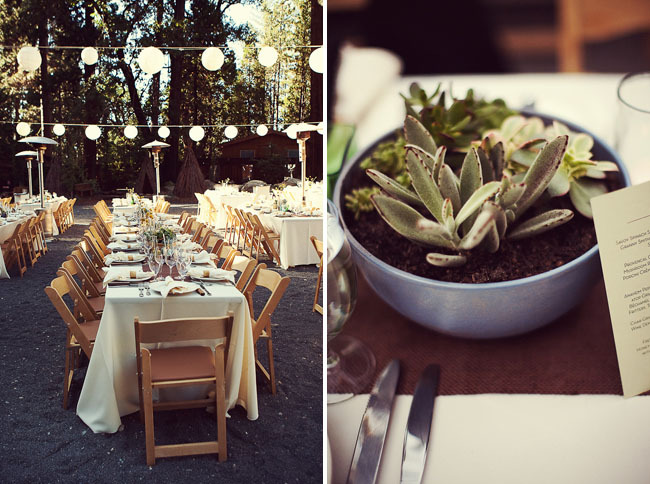 loving the earthy decor to the wedding! Wow. This is so unbelieveably beautiful. 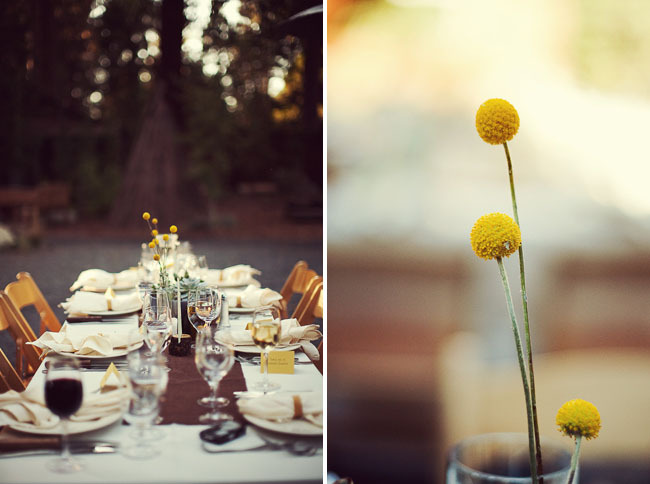 The photos of the ceremony and reception sites– Perfection. Can you share where the lovely veil is from? those flowers are absolutely stunning! Totally stunning images congratulations to the photographer and couple well Done ! that is the prettiest veil ever. EVER. Oh my gosh! The photo of those naked little girls cracks me up! I love it! Really beautiful. Wow… I love this SO much. 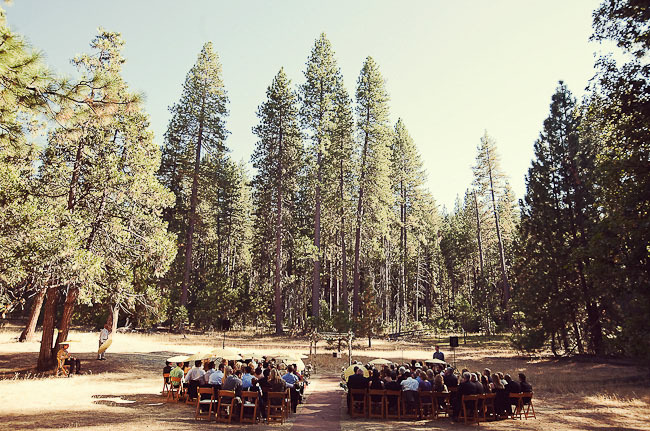 Yosemite is beautiful and I can’t wait to get back there one day… what a magical place to get married. Love everything about this! Those are some killer groom socks!! Yosemite is one of my favorite places!!! Love love love the cake and flowers. So beautiful!! This wedding is beautiful! 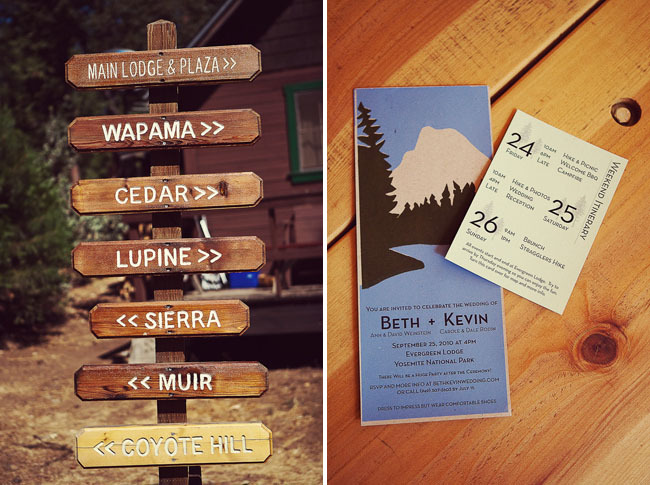 I am getting married at Evergreen Lodge this summer and am really inspired by this…where did you get the invitations? Love them! These are some amazing photographs, and this is a wonderful wedding with some really unique ideas. Especially the fingerprints and the chupah ideas. The scenery is fantastic and there are so many personal details such as Charles Dickens inspiring words or leaving your finger stamp. The kids look so great and natural. Simply love it! Beautiful wedding! I love the flower girl dresses. They are exactly what I’m looking for. Can you share where ou got them? I love the chuppah canopy! I’d love to know where the circles/ confetti are from….. Cheers! I love the quote on the table!! I am thinking of doing something similar, but am having trouble coming up with enough quality love quotes. What time of year was it??? LOVE LOVE LOVE it. I love this wedding. I love the venue, I would love a name of that venue to look up..
Who created for her a very natural beauty look where the focus of attention was on the lips, painted a soft pink tone.